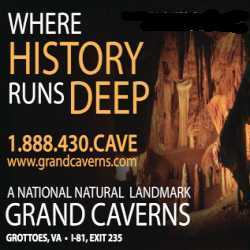 Grand Caverns is a Natural National Landmark show cave located in Grottoes, Virginia. It is ranked the #2 caverns in the United States of America and is America's Oldest Show Cave. Shenandoah Caverns is an ideal destination for anyone who enjoys visiting multiple attractions at one location. There are now four attractions on site at this remarkable underground caverns site. You can take a guided one hour tour of this fascinating and beautiful cave. 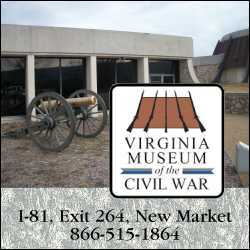 New Market Battlefield State Historical Park, the Virginia Museum of the Civil War, and the 19th Century Bushong Farm, commemorate a unique moment in American history--- when college boys, Cadets from VMI, engaged in pitched battle and helped win a victory for the Confederate Army. The Augusta Military Academy Museum is located in the AMA Alumni House in Fort Defiance, Virginia. The museum sits among stately old trees and expansive lawns on the grounds of the now-closed military academy. Welcome to the historic Edinburg Mill, one of the few Mills to survive the burning during the Civil War. The Mill also provides a visitor center and gift shop. The Heritage Museum offer exhibits relating to the history and folk life of the Cental Shenandoah Valley, including its distinctive Civil War stories. Since 1741 Virginia Citizens Have Become American Soldiers And Made World History. Experience the pre-war life of Confederate General Thomas J. "Stonewall" Jackson at this historic home, garden, and museum shop.